Credit: X-ray: NASA/CXC/SAO; Optical: NASA/STScI; Infrared: NASA/JPL-Caltech/Steward/O.Krause et al. 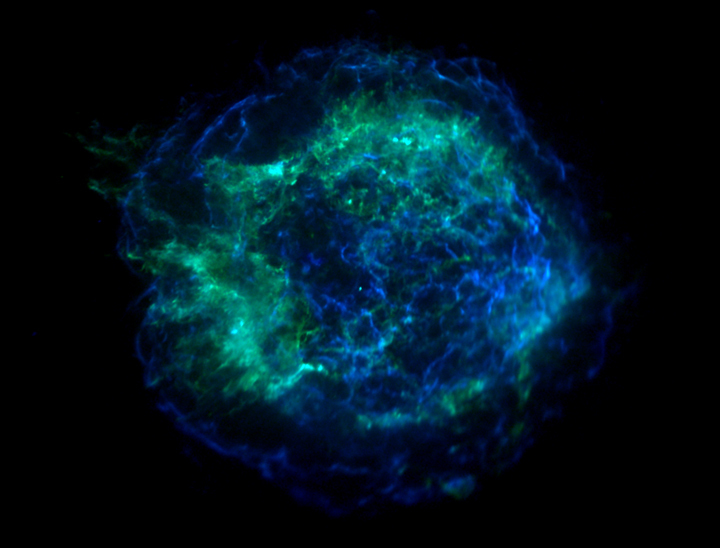 This stunning picture of the supernova remnant Cassiopeia A (Cas A) is a composite of images taken by three of NASA's Great Observatories. Infrared data from the Spitzer Space Telescope are colored red; optical data from the Hubble Space Telescope are yellow; and X-ray data from the Chandra X-ray Observatory are green and blue. 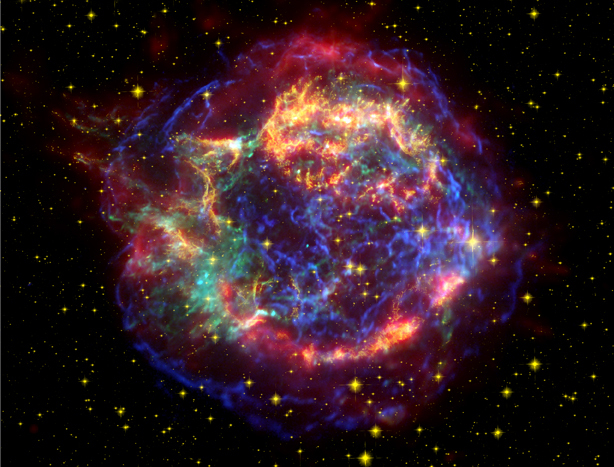 Cas A is the 300-year-old remnant created by the supernova explosion of a massive star. Each Great Observatory image highlights different characteristics of the remnant. Spitzer reveals warm dust in the outer shell with temperatures of about 10 degrees Celsius (80 degrees Fahrenheit), and Hubble sees the delicate filamentary structures of warmer gases about 10,000 degrees Celsius. Chandra shows hot gases at about 10 million degrees Celsius. This hot gas was created when ejected material from the supernova smashed into surrounding gas and dust at speeds of about ten million miles per hour. A comparison of the infrared and X-ray images of Cas A should enable astronomers to better understand how relatively cool dust grains can coexist in the superhot gas that produces the X-rays. It should also help to determine whether most of the dust in the supernova remnant came from the massive star before it exploded, or from the rapidly expanding supernova ejecta. The turquoise dot at the center of the shell may be a neutron star created during the supernova. Blue Chandra data were acquired using broadband X-rays (low through high energies); green Chandra data correspond only to intermediate energy X-rays; yellow Hubble data were taken using a 900 nanometer-wavelength filter, and red Spitzer data are from the telescope's 24-micron detector. Credit X-ray: NASA/CXC/SAO; Optical: NASA/STScI; Infrared: NASA/JPL-Caltech/Steward/O.Krause et al. Scale Image is 8 arcmin per side. Coordinates (J2000) RA 23h 23m 26.7s | Dec +58° 49´ 03.00"